The zeitnot Private Chat is a program that allow you to send text messages privately to another party. 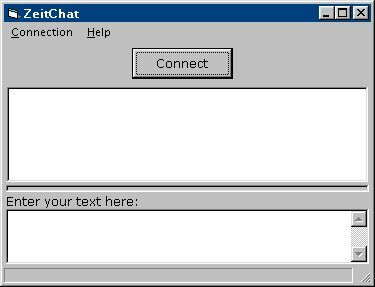 The zeitnot Private Chat is free software distributed under the GNU GPL. Select Connection from the menu. The Option window shows up. Select the I Want to Connect or I Want to Listen option. The other party will have to select the other one. 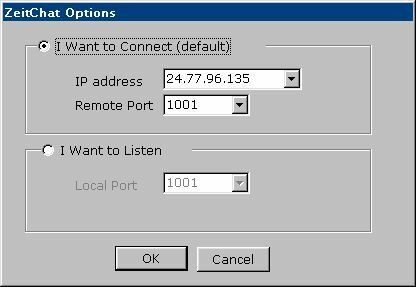 I Want to Connect: Type in the other party's IP address and a Remote Port. I Want to Listen: Type in the other party's Remote Port. Click OK, the Option window will go and back to the main window. Both parties can click the Connect button now. When the status bar says Connection Connected (he!) or Connection Listening, you can start sending message. Type your messages in the bottom textbox. The ENTER key sends the message. To send a multiline message, press the CTRL+ENTER keys. The top textbox show your messages in black and the other party's messages in blue. That's it! Run the ZeitChat.exe file to launch the program.